"To let go you've got to first name your baggage, then drop it, so that you can become a stronger young woman (or man) for the body of Christ." What is it exactly that we are holding onto and not letting go of so that the Lord may strengthen us and lead us through a new season in our life as we were purposed to do so all along...baggage-less? Profound question is it not? I've thought a lot about letting go lately. It all started this past week when I felt like the world was slipping out from beneath my feet. I've had no control over the tides that have been rising around me, and with those tides have come fear and me trying so desperately to hold onto things which I must now let go. My baggage has been named and has now been laid at the feet of my sweet Jesus I am happy to report! I think I am getting ahead of myself...you probably want to know more about how I arrived at the discovery of my baggage-filled-life's-scape and came to name it and set it free by letting it all go into His hands aren't you? Are you holding onto fear of a new season in your life that is sure to come whether you feel like welcoming it or not? What about holding hate against/for someone in your heart and soul when you know you need to surrender it to God for good...again? "No" you say certainly with all the most sure-thing-attitude in the world, but are you really sure? Is there perhaps a relationship that you are holding onto too tightly, so tightly in fact that the other half of that 50/50 relationship just can't make a move because you are holding them back from letting God be the sounding voice in their ears? Are you wondering what lies ahead for you in your future....what job will you end up working in inevitably...or entertaining thoughts about when that special someone will sweep you off of your feet for forever with a ring? All of those questions (and thoughts that were posed) that I just asked you...well, that is exactly what I've been faced with and have been sorting out within my weighed down mind for the last few weeks. I've only just recently realized just how much baggage I actually was carrying around on my spiritual body this past Sunday when our Pastor preached on The Body and the significance of letting go of our own baggage so that we can come to the table of Christ as a whole body, not fragmented and scarred from holding onto baggage that was not meant to be held. It seems as though God has REALLY been trying to speak to me lately. He's been asking me to come to Him and release so much of myself, my baggage. For a while there I'd seemingly hid from Him, His voice, His Word, Prayer with Him...and myself. I've so many changes and things that are getting ready to hit me, and to be honest I am not one who deals well with lots of changes, whether they be awesome or terrible ones, very well at all, never have been really. Right about the time I felt bogged down by everything this past week I heard the Lord say "Let Go." I really didn't pay too much heed to it entirely, but then I got my e-devotion one morning on my laptop, and you guessed it, it was about letting go and giving everything over to Him. Then this past Sunday I went to Church for the first time in a long while (my momma's surgery and the Holidays kind of kept us from attending) and the Pastor's message was on letting go of our baggage so that we can be a better and stronger body as a whole in and for Christ. I was floored as I sat alone in the Church/gym on Sunday morning and heard those two words once again, "Let go." How could I not get what God was trying to say to me at this point, I mean really!? Pastor Niel walked up on the stage to start his sermon, his back held a backpack, he had a side saddle bag hanging on one side of his body and two suitcases held in his hands. The pastor preached the whole sermon while holding onto all of his "baggage" and the point was made very clear...and getting clearer by the moment to me, that in order to be a strong daughter of the King I first had to identify those heavy bags in my own life that were weighing me down so that I could live for Him and His body of Christians more strongly than ever before. "If one part suffers, every part suffers with it; if one part is honored, every part rejoices with it. Now you are the body of Christ, and each one of you is a part of it." When we begin to let a few bags down, that's a great start right, but if you are still holding onto let's say one or two bags you can surely manage because after all you're not holding onto all of those bags anymore, right? Well, that is exactly what I've been doing for over a year now. I seemed as if I was okay, but really I've been holding onto this one bag in particular longer than I've held my other bags...this one was growing into something I could not contain and conquer myself. This bag was hate. Over a year ago I had been wounded by a fellow Sister in Christ very deeply and honestly it tore me to pieces, broke me down and made me and my life miserable. At first I thought that it was okay to hold onto this bag because I had been wronged after all, but what I didn't realize was that slowly, over time that bag of hurt started morphing into bitterness, then bitterness into anger, and then ultimately anger into hate. I am ashamed to say that I've hated, yes hated, this fellow sister in Christ. It was wrong, so wrong of me to feel this way towards my sister. I've now realized all of this this past Sunday when the Pastor asked if there were any bags that we needed to let go of, and I prayed in Church, with my hands outstretched high, releasing that hate and asking Him to fill me and that hole in my heart where extreme pain had metamorphosed into hate. 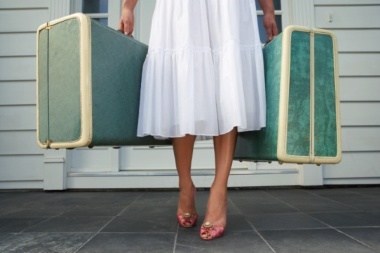 I felt free after I had named my baggage and let it go into God's merciful hands. That's not where the story ends though... The Pastor was holding onto 4 bags throughout the entire service, and in my mind I had already named all 4 of those bags, because there were exactly 4 things in my mind and heart that I knew that I needed to let go of. God was showing me all of those things that morning in Church. He had been speaking to me all along, but I was just too consumed with my baggage and fears to hear Him. As I realized this I began to feel the warm slow silent streams of small tears trickling down my cheeks. I knew that I was free. I knew that I had finally been released and that now that I had become free from my burdens of baggage that I was going to be a stronger daughter of the King...a stronger part of His body. I pray for you dear readers, that whatever hidden baggage lies within you and your life that you will too be set free. Even if you think that you have moved on, checked a few of your bags at the gate and proceeded on with your flight of life with only a mere small carry on bag that you just know you can handle by yourself, that you'll take a moment to pray and search your heart for that bag, tiny as it may be in your life. That tiny bag will surely begin to get heavier and heavier as the flight of life drags on I assure you. Only He can reveal that baggage of the heart to you. Only He can take it from your burdened shoulders, dear ones! I hope that you will see that through my story of letting go of hate towards my SIC, my relationship with Jared, my fear of the unknown etc. that no matter how small the bag, it is indeed damaging and will prevent you from being the daughter or son of the King and part of His wonderful body that you need to be. I LOVE this post! Thank you for sharing these words! I know the experience of walking the road of hurt, which morphs into bitterness, and so on, until I realized about two years later I was carrying a much heavier bag than I started with, only because I couldn't - or maybe wouldn't - forgive and let go. The past few years have been a process of letting that hurt go, along with the malicious emotions that came with it. And somewhat, but not entirely, related to that hurt, I have learned so much about surrender and release this past year. God is showing me that He is enough, that my dreams are only fully realized in Him, that that which I hold onto so tightly is exactly what I'm supposed to be freely surrendering. It's been a journey. It's still a journey. But praise Him; He is patient with me, and I am learning to let go. Thank you SO MUCH for this post Sarah! You have blessed my heart more than you know. Very wonderful post! <3 Hope you have a nice weekend! Oh Sarah. This post was beautiful! I needed to read this. Thank you.